It might sound strange, but I like wiring Vintage British Motorcycles! But, I also like to update them and eliminate some of the problem areas and potential for having to push the bike - way too old to be pushing motorcycles! I already documented the 1972 Norton Commando Combat wiring but several people have asked for details that I didn't record and I promised to provide more detail on the next one - here it is. Use standard 18ga wire and standard colors. Where there is any deviation, I will spell it out. The modern wire is the same gauge and same number of strands, but the insulation is thinner so it is easier to run. 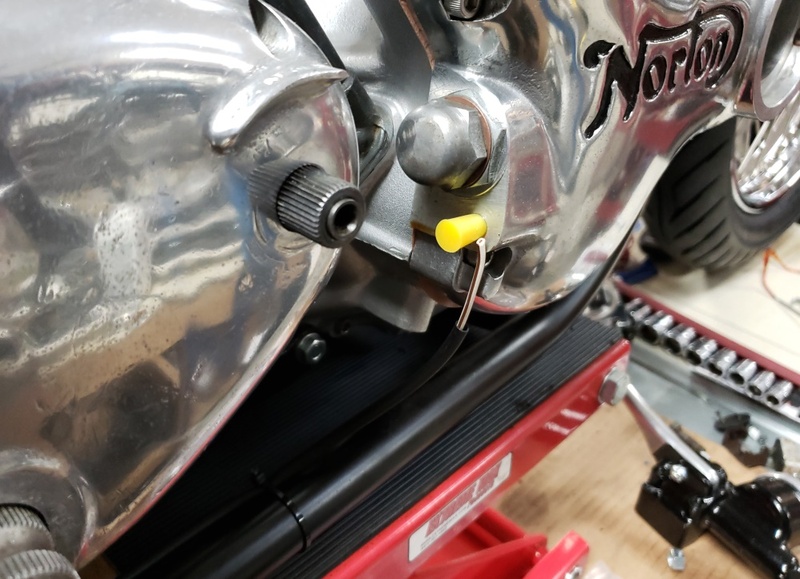 On most bikes, I take apart old harnesses and reuse the wire, but almost all Norton wires are short due to the connection under the tank, so I'll mostly be using new wire. Replace the points and condensers with a Tri-Spark ignition. Replace the Zener Diode and Bridge Rectifier with a PODtronics (haven't decided which one yet). Add an oil pressure switch and replace the Warning Light Assimilator with my Battery/Oil Pressure Monitor, look here. Eliminate connectors wherever possible/reasonable. Standard Norton wiring has LOTS of connectors under the tank. This was done so they could use one rear harness for multiple bikes (standard, police, etc.) The only thing some might consider good is that reduces the wiring in the headlight shell. It makes handlebar wiring a mess, especially when changing the size of the bars. Normally Nortons use a headlight shell with one wiring hole on the bottom and that will work here as well. I have headlight shells wiht three wiring holes on the bottom which makes the wiring a little cleaner so I'll used that. The frame is not a part of the ground on a Norton due to the isolastic engine mounts! I modify the rear turn signals to have a ground wire and I add a ground wire for the taillight. All three connect to a ground wire that runs the length of the bike - this will become clear later. On other Vintage British bikes, the frame is a good ground so this is not an issue. I use a combination of sleeving, vinyl harness wrap, and heat shrink tubing. The harness wrap is NOT electrical tape - it has no adhesive and never gets sticky. I prefer to have the main run vinyl wrapped and the smaller runs off it in sleeving. It can all be done in vinyl wrap - many modern cars are that way from the manufacturer. Vinyl wrapping it all is actually easier, but the way I do it looks better for those wires that can be seen. I buy all my wiring products from British Wiring. I have no affiliation with them, I'm simply a customer. Throughout this I will provide their part number for each component. British Wiring sells wire by the meter and they sell every color needed. I'll attempt to tell you how many meters of each wire you need. In most cases, I connect one end of the wires and run them to the other end without connecting them and I leave them a little long. Along the way, I tie wrap the harness as I build it. If you try to cut wires to length up front you will end up to short or long almost every time! Generally, I won't be able to tell you the exact length but I will tell you how long each wire is when I run it. When I do state an exact length, I might change it later - especially for sleeving. Red, 18ga wire about 32"
White/Brown, 18ga wire about 68"
Purple/Black, 18ga wire. I had 2 meters and needed most of that so I didn't cut it. 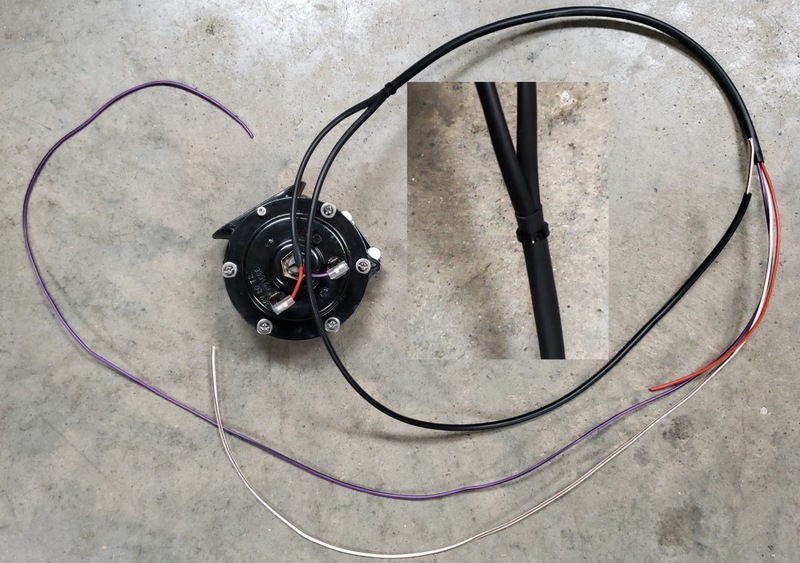 Feed the White/Brown wire through the 25" 3mm sleeving and leave about 2" at one end - this will connect to the oil pressure switch. the other end will go to the oil pressure light in the headlight. Feed the Red and Purple/Black wire through the 6" 3mm sleeving and leave about 2" at one end. Terminate those both with a 1/4" 90 degree female spade terminal and matching cover. Feed the other end of all three wires through the 15" 6mm sleeving. 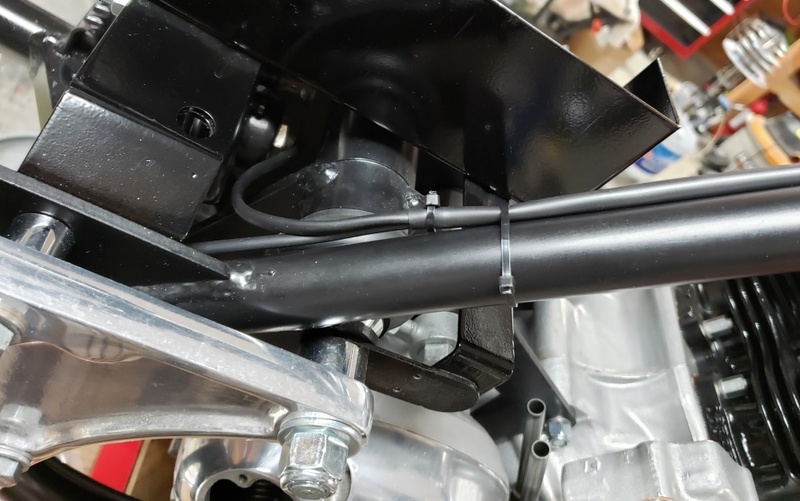 Connect the two spade terminals to the horn and adjust the wires in the sleeving to run nicely towards the frame tube next to the gearbox and temporarily tie wrap it in place. Connect the White/Brown wire to the oil pressure switch (use whichever connector it requires) and run it along the bottom frame tube and up to the other two wires. Now, slide the 6mm sleeving down over the two 3mm sleevings. It will be a little difficult to get them to go it, but it can be done. Push them in about 1/2". It's not actually required, but I used a small tie wrap over the junction - just make it snug. Then run the cable up the frame tube and install a couple of tie wraps. This will go through the frame grommet and connect into the main harness run under the tank. The the wiring temporarily installed so I could take the pictures. Once I have the oil lines installed, I'll do the final routing and tie down. March 10, 2019 Although I like to reduce hte number of connectors wherever possible, I may add one to the horn/oil pressure cable. If I hard wire it into the harness cable, I won't be able to get the main harness off the bike for the final wrapping.